Every retail-centric business has to perform merchandising activities. From stores to manufacturers, distributors, and marketing agencies, companies in retail need to make sure that products are being distributed and displayed correctly. However, retail means multiples: Multiple stores, multiple products, multiple cities, sometimes multiple brands… And, most definitely, multiple people performing merchandising activities generating a huge amount of data. This means that detecting threats and opportunities within the captured data becomes increasingly difficult as business grows, therefore mission-critical issues such as frequent out-of stocks or damaged shipments can easily be overlooked. Field merchandising software can greatly simplify reporting in retail and make it easier to take charge of non-conforming situations, as well as to grasp opportunities for business growth. With a field merchandising software solution in place, reps will capture data by filling in forms on a mobile app. Upon synchronizing, the captured data will be readily available for managers to run reports, that can then be filtered in order to pinpoint mission-critical information. So not only field merchandising software expedites the time between data capture and reporting, but it also allows for a faster addressing of urgent issues. VisitBasis field merchandising software is a complete mobile data collection solution designed to build, schedule and monitor store activities in real time. 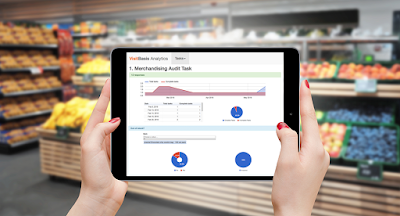 It provides tools for all types of retail merchandising activities, including planogram checks, audits, inspections, surveys, POS asset management, training, product sampling and demonstrations, among others, and allows instant access to captured data upon completion of visits. See for yourself how VisitBasis field merchandising software will generate retail audit reports in a breeze: Schedule an online demo with our team or sign up for a free trial!